In particular, we managed to develop our own methodology for forecasting and analyzing the outcomes of sporting events. This achievement gives us some independence. However, we use any chances and opportunities. Therefore, we also use forecasts from the leaders of the betting industry, if such predictions do not contradict with our own forecasts and conclusions. By consolidating and uniting information, we always get a consistently positive result, which causes fair respect of competitors and the trust of our customers. Guided by the basic principles of steady development and evolution of the company. We have reached certain progress in business and can confidently declare our viability in the process of providing stable passive income for our investors. Accounts: U19004087->U4603107. Memo: API Payment. 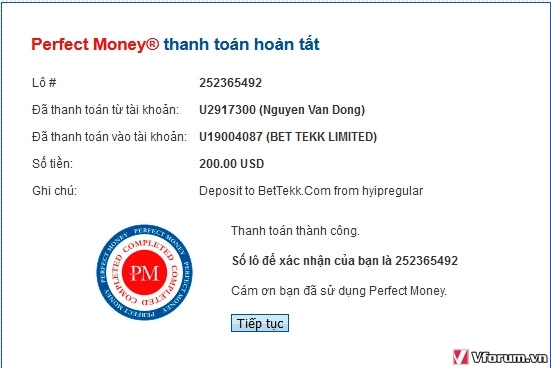 Withdraw to hyiptank from BetTekk.Com.. Date: 04:58 25.03.19. Batch: 252487990. Date: 08:52 26.03.19. Batch: 252666918. Date: 02:35 27.03.19. Batch: 252780371. Date: 05:06 28.03.19. Batch: 252938519. Date: 05:34 29.03.19. Batch: 253083251. Date: 07:25 30.03.19. Batch: 253220974. Date: 17:11 31.03.19. Batch: 253384229. Date: 06:13 01.04.19. Batch: 253431839.